After you have reviewed this free English lesson make sure to download it so you can use it for homework or in your English class. 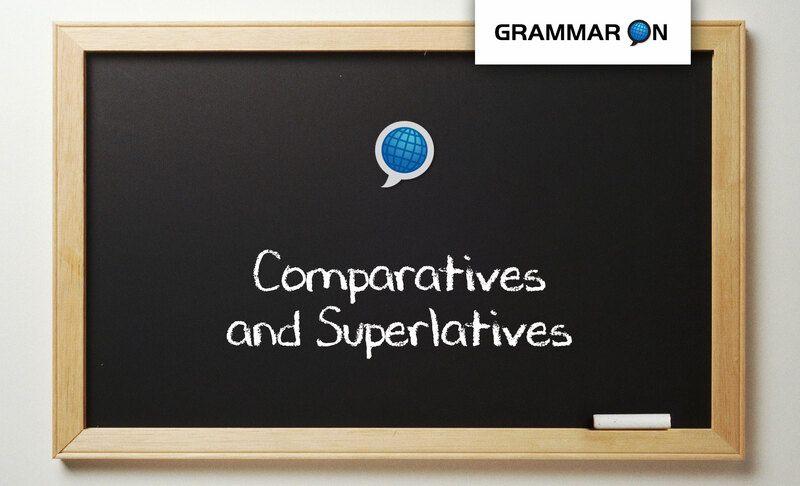 Learn when and why use comparatives and superlatives in English! We use the ‘comparative‘ when we compare two things. We use the ‘superlative‘ when we speak about something of the highest order, quality or degree. Learn how to use comparatives and superlatives in English for “short” adjectives! When we have “short” adjectives, usually one or two syllables, we add “-er + than“ to form the comparative and “the + -est“ to form the superlative. A Honda Civic is small. A cheeseburger is large. The USA is bigger than France. A Mini Cooper is smaller than a Honda Civic. A double cheeseburger is larger than a cheeseburger. Russia is the biggest country in the world. A Smart Car is the smallest. A Big Mac is the largest item on the menu. 1. If a word ends with a consonant-vowel-consonant, double the last letter (except if the word ends with a w, x, or z). FOR EXAMPLE: Big = Bigger, Biggest, Small = Smaller, Smallest, Hot = Hotter, Hottest. 2. If the adjective ends in “e”, just add “r” or ‘st’. Learn how to use comparatives and superlatives in English for “long” adjectives! When we have “long” adjectives, usually two or more syllables, we add “more + than“ to form the comparative and “the + -most“ to form the superlative. Michael Jackson is more famous than Berlusconi. A BMW is more expensive than a Honda. A senator is more important than a mayor in the USA. Marilyn Monroe was the most famous person in the 1960’s. A Ferrari is the most expensive car in the world. The president is the most important person in the USA. 1. If a word ends with a y, replace it with –ier in the comparative form, and –iest in the superlative form. Below are some of the common exceptions that don’t follow the rules above. Good: My test score is good. Her test score is better than mine. Ruth’s test score is the best in the class. Bad: The weather is bad. Yesterday, the weather was worse than today. Two days ago, the weather was the worst. Complete the sentences with the most appropriate comparative or superlative phrase of the adjective given. 1. Mary is _______________________________ (lazy) student in the class. 2. Rob’s apartment is _______________________________ (nice) mine. 3. Elephants are _______________________________ (fat) camels. 4. Miami is _______________________________ (superficial) city in the U.S.
5. Kim is _______________________________ (small) of all my friends. more often and are much more unpredictable. 7. Laura speaks English _______________________________ (good) Susan.